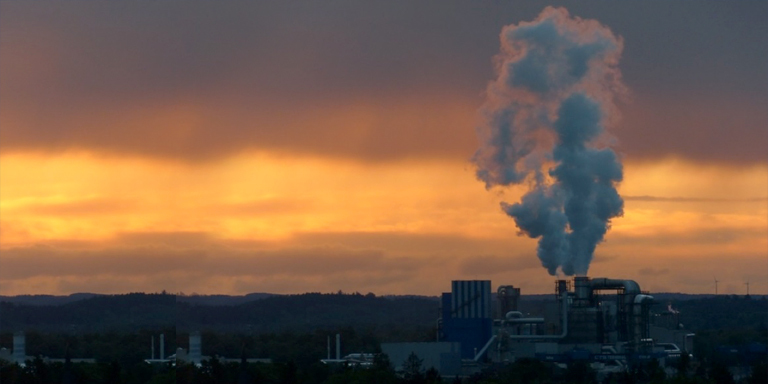 Efforts are needed to get third parties engaged in the emissions market. It has been 4 years since the emissions market was launched in the Republic of Korea, but its growth has been stunted by a number of reasons. To establish an efficient market, greater efforts are needed to either get third parties engaged sooner―which turns out to be a prerequisite for an efficient market as is shown in overseas cases―or at least ensure a full opening of the market by 2021 as scheduled. In the Republic of Korea, the market for Certified Emission Reduction (CER) was launched 4 years ago, and the 3-year second phase began this year. On July 24, the government confirmed "a revised roadmap to reach reduction target by 2030" and "a second-stage planning for emission allocation for the year 2018 through 2020." The second-stage planning involves paid allocation of some of the emission rights through an auction, as well as introduction of market makers to enhance market liquidity. During the 3-year first phase, the fledgling emissions market has revealed various limitations. Compared to leading global markets like the European Union Emissions Trading System (EU-ETS), the Korean market has restricted market participants to those who actually need an emission right, and no derivatives have been introduced. Further, the market has been managed without market makers or systematic measures for market stabilization. As a result, the market has remained largely illiquid, and has even more illiquidity aggregated as the government has implemented stabilization measures at its discretion without firm rules. 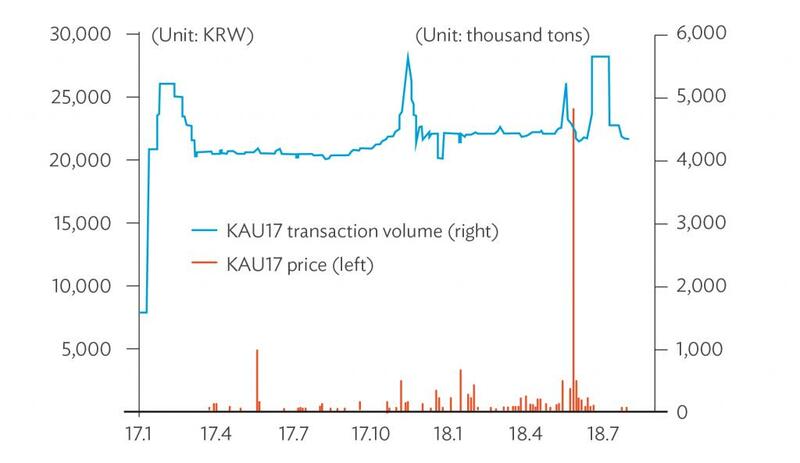 Notes: KAU17 denotes the Korean Allowance Units allocated by 2017 and transacted by June 2018. Closing prices. Note: KAU17 denotes the Korean Allowance Units allocated by 2017 and transacted by June 2018. Starting from this year, auctions would be held for paid allocation of some of the emission rights and market makers would be introduced. Still such gradual approach is unlikely to boost emissions market effectively. As for the new auction scheme, 37 out of 63 participating industries would still be given 100% free emission rights; and for the remaining 26 industries, only 3% of the rights would be paid allocations. From this year, Korea Development Bank (KDB), Industrial Bank of Korea (IBK), and Korea EXIM Bank would serve as market makers to provide liquidity to the emissions market. However, these lukewarm measures are unlikely to transform the sluggish market. As the experience of the EU-ETS shows, market efficiency can be only boosted when a wide array of suppliers and consumers are allowed in the market, without which prices suddenly fluctuate and it takes longer to reflect new information to the price. For reference, the EU-ETS allowed for unlimited range of participants from the outset (Note: During the first-stage of the EU-ETS in year 2005 through 2007, 45% of all transactions were made through financial firms' accounts). Balietti (2016) argued that financial firms can stimulate transactions by serving as a flexible counter party, accommodating widely varying needs for emission across different industries. For instance, energy firms increase transactions when volatility grows, while manufacturers do the opposite. Under this circumstance, financial firms can increase transactions with energy firms during volatile times, and do so with manufacturers during stable times. Such effective third-party participants are sorely missing in the Korean emissions market. The introduction of third parties is scheduled for later phases in fear of a possibility of speculative behaviors, market over-heating, growing volatility, and economic loss of participants who actually need emission rights. However, it needs to be reminded that the fundamental reason for adopting CER instead of more direct regulations or emission tax is the difficulty of collecting accurate information on emission-reducing technologies or associated costs. Overseas cases show that policies that put priority on market efficiency are in accordance with the goal of the emissions market. To make a swift transition to an emissions market operating on market principles, greater efforts are needed to either get third parties engaged sooner―which is currently scheduled for the third-stage planning―or at least ensure full opening of the market in 2021 when the third-stage planning becomes effective. A. Balietti. 2016. Trader Types and Volatility of Emission Allowance Prices. Evidence from EU ETS Phase I, Energy Policy. 98. pp. 607–620. Amsterdam: Elsevier. Taehoon Youn has been a research fellow at the Korea Institute of Finance (KIF) since 2010. Before joining the KIF, he worked as director of the Department of Market and Institutions at Korea Development Institute. He has worked as a consultant at PwC Consulting and as a research fellow at Korea Institute of Public Finance after he received his Ph.D. in Economics from the University of Michigan at Ann Arbor in 1999.